There are times when you wish that a moment could be captured forever. A special glance, a secret smile or some other important event is a rare occurrence and is hard to capture using a photo camera. Videos on the other hand are laced with such moments, which unfortunately are too brief and disappear within instants. With the Take Snap feature in Video Edit Magic, you can extract these special moments by finding them in the video clip, capturing the freeze frame, and saving the image. Taking snaps from your video clips is a useful feature. Instead of sending entire videos containing extra footage to friends, family and colleagues, you can email just the important frames. 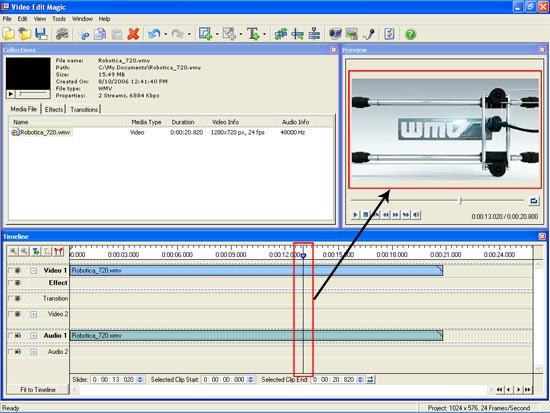 You can connect your digital camcorder to your PC and import the captured video into Video Edit Magic. You can then use the Take Snap feature to extract the best moments and save them as unforgettable pictures. The Take Snap feature can also be used to produce title slides for your videos. Just take a snap, move it to the beginning of the Timeline (or to the beginning of a section), add titles and impress your friends with your professional looking movie. Click on Capture from under the Tools menu. In the Capture window, click on the Options button. The Options window opens. In the General tab, under Save Options, specify the location where you would like to save the captured video. Select the Output tab. Please make sure that the Output options are set to AVI. This is because AVI files can be edited easily. Click on OK to go back to the Capture window. To start capturing, click on the Start Capture button. When you believe that you have enough video to work with, click on Stop Capture. You are now ready to Take Snaps from your video. Import the video file you just captured from your hard drive by clicking on Open File from under the File menu. You can import any video and Take Snaps from it. Add your video to the Timeline. To add it to the Timeline, select it first in the Collections window, right click on it, and select Add to Timeline. Alternately, you can simply drag it from the Collections window to one of the Video tracks in the Timeline. Position the Seek Slider at the frame you want to capture on the Timeline. Use the Preview window to position the slider accurately on the frame you wish to capture. The image in the Preview window would be captured as an image file. Open the Tools menu and click on Take Snap. You can also use the shortcut CTRL + F2. In the Take Snap window, specify the type of Output Format, dimensions of the image and the image Quality. Select which of the three available frames you want to capture, then click on OK to save the image to the path specified under Save To. Add the image file you had created using the Take Snap Feature, to the Timeline. Click on the Add Text button on the toolbar to launch the Add Text properties window. You can add text using different fonts, backgrounds, styles and positions to get the title effect you want. In the File menu of the Add Text properties window, click on Save and Close. Move the snap and the Text effect to the beginning of the Timeline or towards the beginning of a particular section of your video. Delete the Video Color Clip that was created along with the Text Effect, and arrange the clips so that the Text Effect and the image file occupy the same range of the Timeline (start and end at the same time). You can vary the times for dramatic effect. Preview the video and resize the text or the image file to get the desired effect. Video Editing is all about your imagination. You can shape your videos in countless ways with the different tools that Video Edit Magic provides. The Take snap feature is no exception. Use Take Snap to break the monotony of continuous playback. Insert captured frames at appropriate moments with text and annotation, and enjoy the praise of everyone you've impressed. You can also make use of the Take Snap feature to create video slide shows using Video Edit Magic. A video slide shows can contain your extracted frames, so you can show only the significant events. You can also decorate your slides with text; apply transitions and effects to create truly spectacular visuals. The size of your slide show would be just a fraction of the original video, letting you distribute it to a wider audience.